This ostrich image just makes me smile, even though she kinda looks like a grumpy librarian! I stamped her twice in black on white card stock, cutting the base from one image and the hat, scarf & beak from the other. I stamped her again in Purple Distress Oxide so I could have colorful glasses to cut out, adding some Nuvo Glitter Drops to it once they were glued to her face. 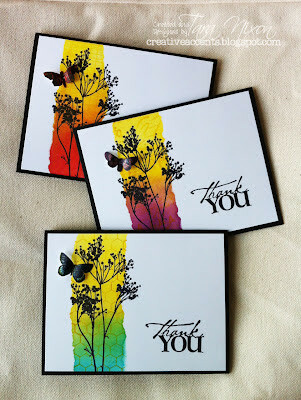 Colorful glasses are my new favorite thing to do with these stamps & dies! There is no way I would fussy cut those glasses, but they are amazing die cut! The other elements were all colored with Copic Markers and mounted with foam adhesive. I kept her white for extra contrast. Since I was working with a kraft card, I experimented with a variety of things and finally decided to stamp assorted words/sentiments in Distress Oxide in the open space of the square portion of the frame. The heart frame was painted with Silver/Sterling paint. I added some shading with stablio pencils in black & white and a few chit-chat stickers to give extra texture & pop. As you can see, I cut the heart frame so it was open to the inside of the card and added a piece of colorful paper to show through the window. This heart was my first attempt at the Distress Oxide technique Tim shared at Creativation, using them on Glossy/Alcohol Ink card stock and finishing up with Distress Glaze. I'll be trying it again and will share the link when I have more success! I added a bit more watered down silver paint around the heart and finished with more stickers & repeats of the stamped words from the front of my card. I had fun with this one- like I said, it's not what I expected when I started creating... but I had fun doing it and I hope it encourages you to look at your stamps and see what sort of combinations you can end up with! Dina Wakley cling stamp "Handwritten Heart Collage"